09.11.18. The journal “Obrabotka Metallov - Metal Working and Material Science” was successfully evaluated and accepted into the ICI Journals Master List database. The Scientific, Technical and Industrial Journal “Obrabotka Metallov - Metal Working and Material Science” was successfully evaluated and accepted into the ICI Journals Master List database. "Obrabotka Metallov / Metal Working and Material Science" – peer-reviewed The scientific, technical and manufacture journal, published since 1999 with a frequency of 4 times a year. The journal is registered with the Federal Service for Supervision of Communications, Information Technology, and Mass Media, a certificate of registration: ПИ N ФС77-23961 dated 05.04.2006. The journal mainly publishes the results of original fundamental, applied and exploratory scientific research and postgraduate work. Considerable attention is paid to the publication of review, problem and discussion papers on topical issues of machine building and modern metallurgy and materials science. Scientific and technical papers sent to the journal are reviewed and edited. Publication of papers is free. The journal is intended for faculty members and researchers of higher educational institutions and research institutes, engineering and technical workers of manufacturing enterprises and design organizations. There are following sections: Technology, Equipment, Tools, Material Science, Conference Materials, Scientific Technical Information, etc. The journal is included in the “List of leading peer-reviewed scientific journals and publications in which the main scientific results of dissertation doctoral and candidate's thesis should be published." 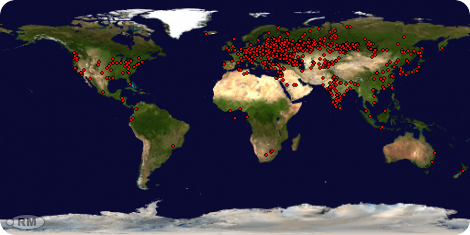 In 2017, the journal "Obrabotka Metallov / Metal Working and Material Science" entered the Emerging Sources Citation Index (ESCI) citation index of the Web of Science database. The journals presented in the ESCI citation index meet most of the Core Collection criteria and are regarded by Clarivate Analytics as the most influential and popular publications with a high probability of high scientific interest. The full text of the journal "Obrabotka Metallov / Metal Working and Material Science" can now be found in the databases of EBSCO Publishing on the platform EBSCOhost. EBSCO Publishing is the world's leading aggregator of scientific and popular publications, as well as electronic and audiobooks. DATE OF FOUNDATION: 1999 - Siberian Tools; since 2001 - Obrabotka Metallov / Metal Working and Material Science. • Limited Liability Company Novosibirsk Scientific-Production Commercial Firm "Mashservispribor". 630073. Novosibirsk, K.Marx Prospekt, 20. You can subscribe to the journal in the publishing house or at the post office. • Ural, the European part of the Russian Federation – 40%. Since 2015, the papers published in the journal are assigned a digital identifier DOI. The metadata of each work is necessarily registered in the international register of scientific and information materials CrossRef. • national digital resource "RUKONT". 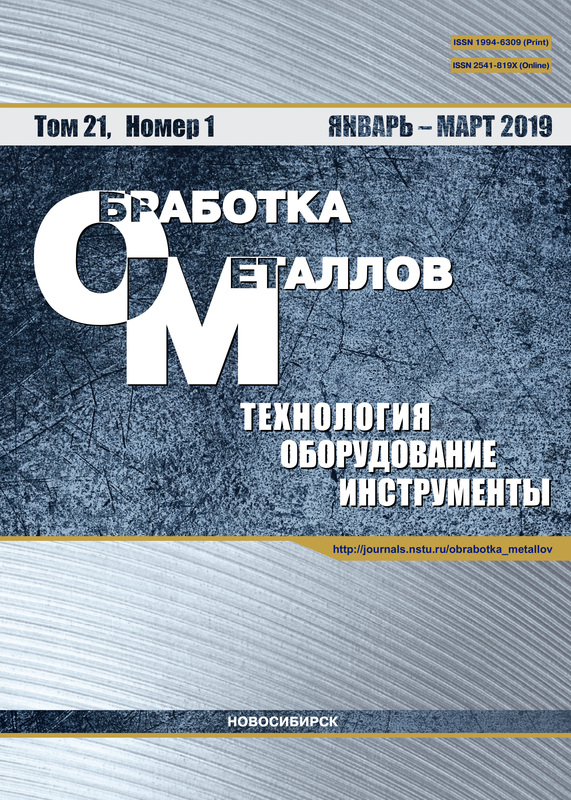 Since 2003, the scientific and technical and production journal “Obrabotka Metallov / Metal Working and Material Science” is the organizer of the annual (third decade of March) All-Russian scientific and practical conference “Problems of increasing the efficiency of metalworking in industry at the present stage” in conjunction with “ITE Siberia” in the framework of the exhibition of equipment for metalworking and welding Mashex Siberia. In 2014 there was a change in the status and title of the conference: International Scientific and Practical Conference “Actual problems in mechanical engineering”. • Economics and organization of the business innovative processes in engineering. Vylezhnev V.P., Sukhikh A.A., Simonov Y.N., Dementev V.B. Skeeba V.Yu., Pushnin V.N., Erohin I.A., Kornev D.Yu. Bagayev S.N., Grachev G.N., Smirnov А.L., Khomyakov M.N., Tokarev A.O., Smirnov P.Yu. Buzyurkin A. E., Gladkiy I. L., Kraus E. I.
Skvortsov V.F., Tsygankov R.S., Boznak A.O., Fedotov V.S. Shevtsova L.I., Bataev I.A., Mali V.I., Anisimov A.G., Lazurenko D.V., Sameyshcheva T.S. Mul D.O., Belousova N.S., Krivezhenko D.S., Shevtsova L.I., Losinskaya A.A.
Investigation of calcium modifier for the manufacture of parts "frame side"
Oskolkova T. N., Bataev A. A., Bataev V. A., Tyurin A. G., Kozurev N. A., Fedorov A. A.
Banshchikova I. A., Muraveva A. E., Tsvelodub I. Yu. Kopeikin S.V., Pilipenko P.A., Ingemansson A.R. Podgornyj Yu.I., Skeeba V.Yu., Kirillov A.V., Pushnin V.N., Erohin I.A., Kornev D.Yu. Rakhimyanov Kh. M., Krasilnikov B. A., Leontyev I. A., Nikitenko M. I.
Vylezhnev V.P., Sukhikh A.A., Simonov Yuriy Nikolaevich, Dementev V.B. Soboleva N.N., Makarov A.V., Malygina I.Yu. Lenivtseva O.G., Bataev I.A., Ivancivsky V.V., Belousova N.S., Golovin E.D., Zimoglyadova T.A. Kovalenko N.A., Olegin I.P., Gotseluk T.B., Chaplygin V.N., Petrov P.M.
Panov D. O., Orlova E.N., Pertsev A.S., Vagin R.A., Simonov Y.N., Smirnov A.I., Nikulina A.A.
Orlova D.V, Danilov V.I., Zuev L.B., Kolesnik A.S., Dulbeeva O.N. Raykov S.V., Vaschuk E.S., Kobzareva T.Yu., Budovskikh E.A., Gromov V.E. Popelyukh P.A., Popelyukh A.I., Yurkevich M.R. Tatarkin E.Y., Kryazhev Y.A., Ognevenko E.S., Kryazhev A.Y. Larichkin A.Yu., Zakharchenko K.V., Gorev B.V., Kapustin V.I. Sizova O.V., Kolubaev A.V., Kolubaev E.A., Zaikina A.A., Rubtsov V.E. Lozhkin V.S., Lozhkina E.A., Mali V.I., Esikov M.A. Pertsev A.S., Panov D.O., Simonov Y.N., Smirnov A.I. Burov S.V., Khudorozhkova Yu.V., Ryzhkov M.A. Medvedeva O.I., Yanyushkin A.S., Popov V.Y. Batygin Yu.V., Hnatov А.V., Trunova I.S. Makarov A.V., Skorynina P.A., Osintseva A.L., Yurovskikh A.S., Savrai R.A.
Romanov D.A., Olesjuk O.V., Budovskikh E.A., Gromov V.E., Krivezhenko D.S. Rakhimyanov Kh.M., Krasilnikov B.A., Yanpolskiy V.V., Kozich T.V. Ovcharenko A. G., Marusin V. V., Ulianitsky V. Yu., Kozlyuk A. Yu., Kurepin M. O.
Pugacheva N.B., Vichuzhanin D.I., Trushina Е.B., Antenorova N.P., Michurov N.S., Orishich A.M., Cherepanov A.N., Malikov A.G.
Saraev Yu.N., Golikov N.I., Dmitriev V.V., Sannikov I.I., Bezborodov V.P., Grigorieva A.A.
Golubev A.O., Krasnorutskiy D.A., Levin V.E., Sapov S.N. Golkovsky M.G., Samojlenko V.V., Popeliukh A.I., Ruktuev A.A., Plotnikova N.V., Belousova N.S. Chesov Y. S., Zverev E. A., Ivancivsky V. V., Skeeba V. Yu., Plotnikova N. V., Lobanov D. V.
Romanov D.A., Olesyuk O.V., Budovskikh E.A., Gromov V.E., Ivanov Yu.F., Teresov A.D.
Afanasjev V.K., Popova M.V., Gerzen V.V., Dolgova S.V., Leis V.A. Saprykin A.A., Gradoboev A.V., Yakovlev V.I., Ibragimov E.A., Babakova E.V. Golovin E.D., Pel A.N., Drobiaz E.A., Veselov S.V., Timarevskiy R.S., Goriaynova O.A., Cherkasova N.Yu. Rakhimyanov Kh. M., Semyonova Yu.S., Sautkina M. A., Skrinnik V. A., Likhatchev A.P. Samoylenko V. V., Lazurenko D.V., Polyakov I.A., Ruktuev A.A., Lenivtseva O.G., Lozhkin V.S. Savrai R. A., Makarov A. V., Soboleva N. N., Malygina I. Y., Osintseva A. L.
Maliutina Iu.N., Stepanova N.V., Cherkov A.G., Chuchkova L.V. Astapov I.A., Eremina K.P., Teslina M.A., Khimukhin S.N., Gostishchev V.V. Skvortsov V.F., Arlyapov A.Y., Ogol I.I., Fedotov V.S. Aksenov V. V., Walter A. V., Beglyakov V. Yu. Ignatov M.N., Ignatova A.M., Artemov A.O., Chumachenko A.Yu., Shevtsova L.I. Reznikov B. S., Gobysh A. V.
Rakhimyanov Kh.M., Krasilnikov B.A., Vasilevskaya S.I. Putilova E.A., Gorkunov E.S., Zadvorkin S.M., Vichuzhanin D.I., Chernomas V.V., Sapchenko I.G., Komarov O.N. Katsyuba A.V., Krupin A.Y., Kudaev S.S.
Podgornyj Yu.I., Martynova T.G., Skeeba V.Yu., Pushnin V.N., Vahrushev N.V., Kornev D.Yu., Zaycev E.K. Sukhanov D.A., Arkhangelskiy L.B., Plotnikova N.V.
Firkhova E.B., Popova N.A., Lyamina G.V., Daulet M., Smirnov A.I., Kurzina I.A. Stepanova N.V., Bataev A.A., Sitnicov A.A., Oskolkova T.N. Chertovskih E. O., Gabets A. V., Gabets D. A., Markov A. M., Okolovich G. A., Komarov P. N.
Tikhomirova L. B., Ilinykh A. S., Galay M. S., Sidorov Je. S.
Gilev V. G., Baryshnikov I. N.
Losinskaya A.A., Drobyaz E.A., Bataev V.A., Plotnikova N.V., Golkovsky M.G. Romanov D.A., Olesyuk O.V., Budovskikh E.A., Vaschuk E.S., Gromov V.E. Ptitsyn S.V., Skeeba V.Yu., Chesov Yu.S., Merezhko E.V. Mozgovoy N. I., Mozgovaya Y. G.
Кobzareva T.Yu., Gromov V.E., Ivanov Yu.F., Konovalov S.V., Budovskikh E.A., Bataev V.A. Bachurin A.S., Bobin K.N., Matveev K.A., Ryngach N.A., Kurlaev N.V.
Mozgovoy N.I., Mozgovaya Y.G., Pashkova E.A. Rakhimyanov Kh.M., Yanpolskiy V.V., Kadyrbaev R.M. Dorohov A.A., Egorov S.A., Dementeva N.A. Chernomas V.V., Bogdanova N.A., Sevastyanov G.M., Sosnin A.A.
Leonov S.L., Tatarkin E.Y., Anzyryaev R.A.
Podgornyj Yu. I., Skeeba V. Yu., Kirillov A. V., Maksimchuk O. V., Lobanov D. V., Gleim V. R., Zhigulev A. K., Sakha O. V.
Panteleenko F.I., Gromyko G.F., Okovity V.V. Panteleenko F.I., Talako T.L., Panteleenko А.F. Erisov Y.A., Surudin S.V., Tiabashvili A.T., Grechnikov F.V. Sokolov A. G., Bobylyov E. E.
Loginova M.V., Yakovlev V.I., Sitnikov A.A., Ivanov S.G., Sobachkin A.V., Negodyaev A.Z., Gradoboev A.V. Podgornyj Yu. I., Martynova T. G., Skeeba V. Yu., Lobanov D. V., Zhirova A. A., Bredikhina A. N., Kosilov A. S., Pechorkina N. S.
Walter A. V., Aksenov V. V., Beglyakov V. Yu., Chazov P. A.
Gilev V.G., Morozov E.A., Purtov I.B. Lenivtseva O.G., Drobyaz E.A., Gontarenko A.S., Zimogliadova T.A., Chuchkova L.V. Yanyushkin Alexander S., Lobanov Dmitry V., Skeeba Vadim Yu., Gartfelder Viktor A., Sekletina Larisa S.
Kornienko E.E., Nikulina A.A., Bannov A.G., Kuz’min V.I., Mildebrath M., Bezrukova V.A., Zhoidik A.A.
Yakovlev V. I., Bataev V. A.
Rakhimyanov Kh.M., Rakhimyanov A.Kh., Smirnov A.N. Khimich M.A., Ibragimov E.A., Saprykin A.A., Bataev V.A. Afanas'ev V. K., Malyuh M. A., Popova M. V., Leis V. A., Dolgova S. V.
Popov V.Y., Yanyushkin A.S., Khlystov A.N. Podgornyj Yu. I., Skeeba V. Yu., Kirillov A. V., Maksimchuk O. V., Skeeba P. Yu. Butukhanov V. A., Lygdenov B. D.
Bataev I.A., Lazurenko D.V., Golkovski M.G., Laptev I.S., Chakin I.K., Ivanchik I.S. Martyushev Nikita V., Zykova Anna P., Bashev Vasily S.
Martynova T.G., Lobanov D. V., Filatov I. S., Skeeba P. Yu. Golyshev A.A., Orishich A.M., Shulyatyev V.B. Kudryashov E.A., Smirnov I.M., Chevychelov S.A., Yatsun E.I. Kornienko Elena E., Kuzmin Viktor I., Loghkin Vasily S., Gulyaev Igor P., Sivkov Alexander A., Ivashutenko Alexander S., Rahmatullin Ilyas A., Sergachev Dmitry V., Bezrukova Viktoriya A.
Alexeev N. S., Kaporin V. A., Ivanov S. V.
Popelyukh A. I., Veselov S. V., Munkueva D. D., Тimonin V. V., Karpov V. N.
Osintseva A. L., Savrai R. A.
Lobanov D.V., Rychkov D.A., Sidorenko S.A.
Veselova Yu.V., Lozhkina E.A., Fedoseeva I.A. Ilinykh Andrey S., Galay Marina S., Sidorov Eduard S.
Ivanov Yu. F., Gromov V. E., Kondratova O. A., Belov E. G., Kosterev V. B.
Gileta V.P., Asanov V.B., Beznedelnyy A.I.